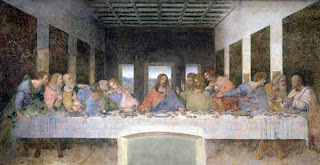 So this is the image we're all familiar with: DaVinci's famous Last Supper fresco. He was inspired by those like Fra Angelico, whose work was always very two dimensional, but told the story it needed to tell. But I have this same question. I know that with everyone sitting on one side of the table it's easier to paint them and give them all equal respect. 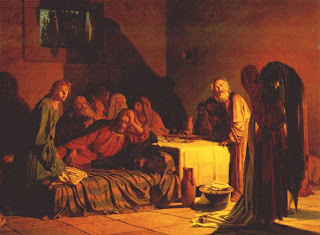 It was believed to be an important technique for the story telling of the day. 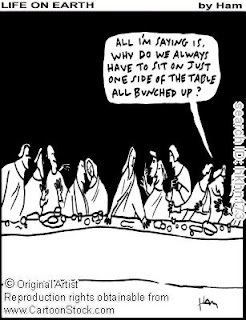 And it has become what we expect to see when the Last Supper is mentioned. I think we can be pretty certain, though, that Jesus and his disciples were not sitting all on one side of a table with halos on anyone's head. 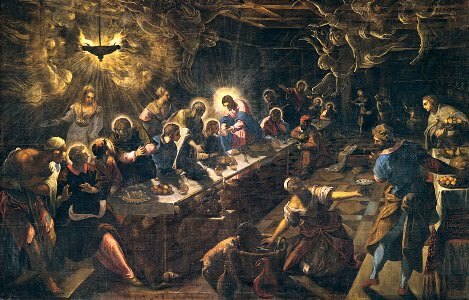 Tintoretto had an interesting take on the usual icon--turn it on an action angle and give it, ya, lots of action. That guy had an imagination. Harry Anderson was bold enough to paint the back of some of the disciples. And Nikolai Ge suggests they weren't even at a table. 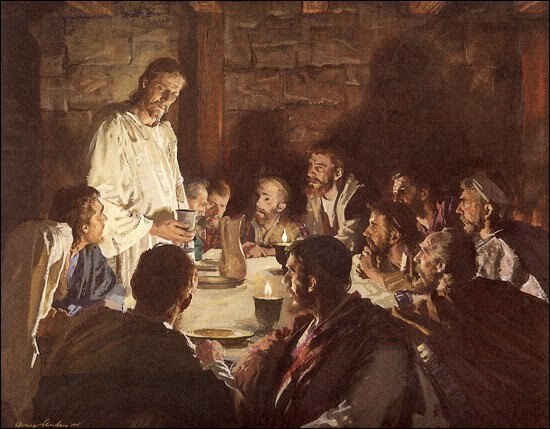 I think it's safe to say none of the artists were actually there and know what it was truly like when Jesus and his closest friends took their last meal together. It was a moment just before the whole world was about to change, never to be same again. Your perspective does make a pretty big difference.